BANGI, 10 Sept 2012 – Iran is interested in doing joint research with The National University of Malaysia (UKM) to develop electric cells powered by solar energy. 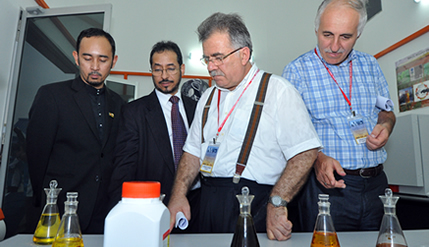 Iran’s Chief Researcher at the Organisation for Science and Technology (IROST), Dr Naser Bagheri Moghadam said he is impressed by what he learnt and saw about UKM’s solar technology development. Dr Moghadam said Iran wants to further develop electric solar cells or photovoltaic cells because his country is aiming to be less reliant on fossil fuel technology despite having an abundance of oil reserves. A photovoltaic cell is an electrical device that converts the energy of light directly into electricity through photovoltaic effect. Iran, he said, has a special interest in solar technology because it receives among the highest duration of sunshine in world – more than 300 days a year. He said utilising Iran’s bountiful sunshine to produce renewable energy is an obvious move. Dr Moghadam was among 10 members of an expert group from the Organisation of Islamic Conference (OIC) nations who were in Malaysia to attend a meeting on research and development last week. They had also visited the UKM’s Green Energy Technology Innovation Park. Other OIC members present were delegates from Saudi Arabia, Qatar, Kazakhstan, Turkey and Brunei. They were met on arrival at the Park by UKM Deputy Vice-Chancellor (Research and Innovation) Professor Dato’ Dr Rahmah Mohamed who represented the Vice-Chacellor Prof Tan Sri Dato’ Wira Dr Sharifah Hapsah Syed Hasan Shahabudin. They were briefed on renewable energy research at UKM by Solar Energy Research Institute (SERI) Director, Prof Dato Dr Kamaruzzaman Sopian. Covering an an area of about one hectare, the site is a showcase of solar-powered projects undertaken by UKM. Started in 2005, it has a low energy green building with solar-powered air-conditioning system. 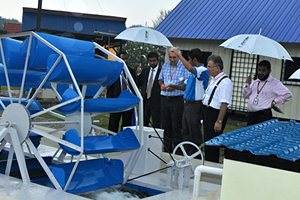 There are also water, biogas and wind turbines exhibits. Several types of eco-friendly fuels, including solar energy, hydrogen fuel cell, bio diesel, organic waste fuels and ethanol are also being researched at UKM.